Lieutenant, Berkshire Yeomanry, Yeomanry Mounted Division. 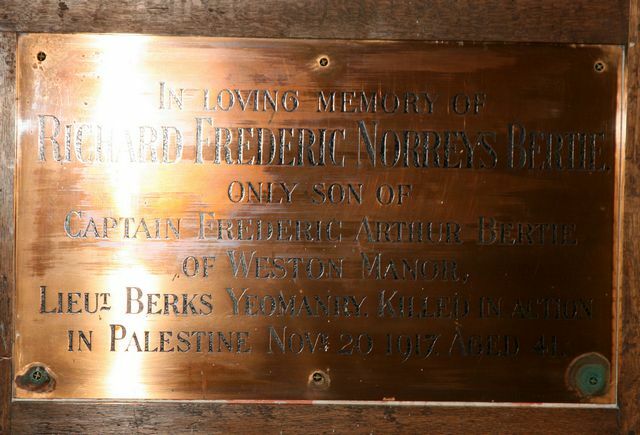 He was the son of Rose Emily Bertie, 13 Bradmore Road, Oxford and the late Captain Frederic Bertie. He was killed in action on 31 May 1918 in the Battle of the Aisne, Somme. He was 34. He was killed in action on 25 September 1915 during the second attack on Bellewaarde. He was 25. He was the son of Albert and Charlotte Porter of Neepawa, Manitoba, Canada. 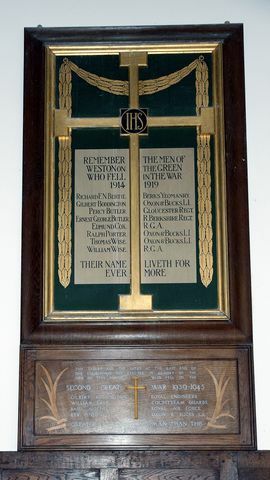 He was the son of John and Harriet Wise of Weston-on-the-Green and the brother of William. He was the son of John and Harriett Wise of Weston-on-the-Green and the brother of Thomas. Sapper, 271 Field Company, Royal Engineers. Army no. He was the son of Reginald and Eva Margaret Boddington, Weston-on-the-Green. Guardsman, 4th Battalion, Coldstream Guards. Army no. He was the son of Norman Albert and Lilian Edith Pinson, Weston-on-the-Green. 28 Training Depot Station opened on 27 July 1918 at RAF Weston on the Green. 2 and 18 Squadrons used the airfield flying Sopwith Camels, Avro 504K's and Sopwith Salamanders. 1939 it reopened. The airfield is still open but it is now a centre for parachuting. Activity ceased on the site in 1921 until the outbreak of war in 1939 it reopened. The airfield is still open but it is now a centre for parachuting.